The Fiat S76, the fastest car in the world in 1911 (unofficially), will turn a wheel for the first time in over 100 years when it tackles the famous hillclimb at the 2014 Goodwood Festival of Speed on June 26-29. Just two Fiat S76 cars were produced by the Italian manufacturer, with the aim of snatching the records for the flying kilometre and flying mile from the ‘Blitzen’ Benzes. 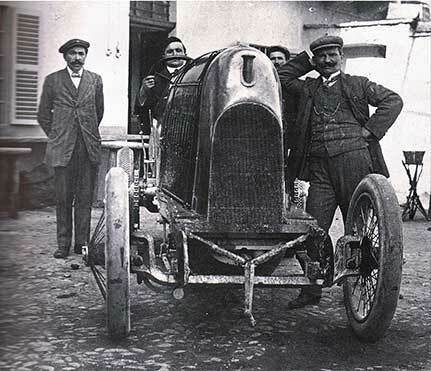 The S76 achieved the mile record with Pietro Bordino at the wheel at Saltburn Sands in 1911 and was officially recorded at over 135mph on a kilometre attempt at Ostenede in Belguim, only to be denied the record as it was unable to complete a return run within the specified one hour. Duncan Pittaway said: “After restoring a Bugatti T35, I was looking for a new challenge and the S76, which is one of the more maligned cars of its generation, fitted the bill nicely. All of the original S76 components that have survived have been restored, from the chassis and engine down to the suspension, axles, pedals, steering box, etc, with the gearbox, radiator and bodywork being created using the original Fiat drawings. As the last and largest of the huge-engined Edwardian monsters, it should be sensational to see.